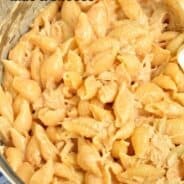 Looking for a delicious, easy dinner idea? 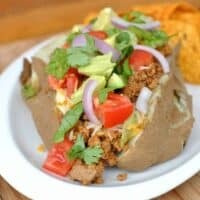 Try combining a classic baked potato with taco seasoned ground turkey! Don’t forget all the toppings! I think it’s official. I can basically turn any meal into a mexican fiesta! I wasn’t sure if baked potatoes would taste good with taco meat, but after one bite, I’m a believer! And, if you’re watching your fat intake, this is a hearty, low fat meal! The lean ground turkey is perfect for this recipe, but if you choose, you can use ground chicken or ground beef in it’s place. Be sure to top your potato with all the fixin’s! Lettuce, tomato, cheese, avocado, red onions and even sour cream, if desired! If you’re interested, I use homemade taco mix for all my taco seasoning needs. It’s great to be able to control the amount of salt and flavor! 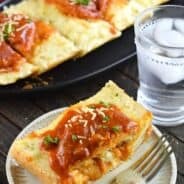 Looking for a delicious, easy dinner idea? 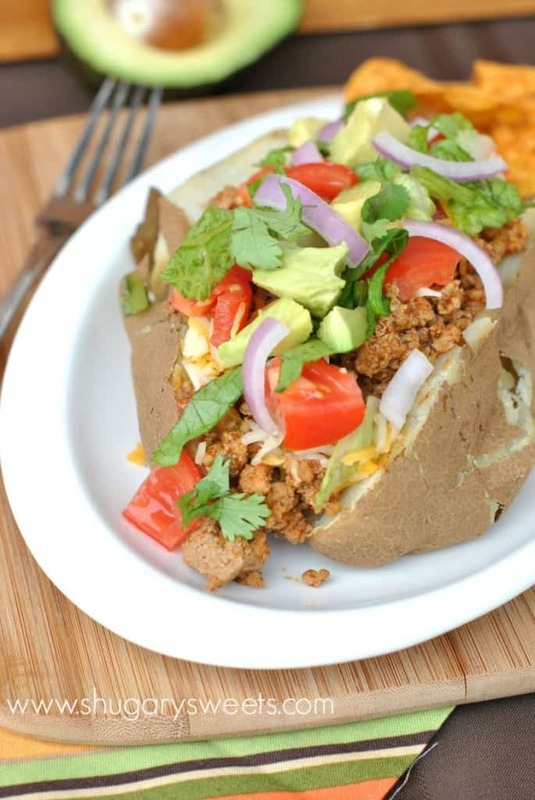 Try combining a classic baked potato with taco seasoned ground turkey! Don't forget all the toppings! Bake potatoes in oven. I like to bake mine directly on the oven rack in a 375 degree F oven for about one hour (pierce potatoes with a fork first). Potatoes will vary in cook times depending on size. Meanwhile, cook ground turkey in a large skillet until browned. Drain. Add taco seasoning and water and simmer for about 10 minutes. To assemble, slice potatoes. Add ground turkey and cheese. Top with desired topping. ENJOY. Love taco potatoes. They are on the regular menu rotation at our house! Whoa, I love the way you think. A Mexican fiesta is always good in my book! This is so creative – Mexican potatoes, I’m thinking I could eat my fair share. Avocado is always one of my fixin’s, it looks so pretty on these! Pinned! What a fun twist on tacos! We actually use a lot of turkey meat around here! These look wonderful! 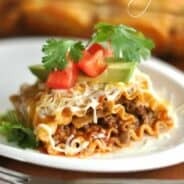 Aimee, I LOVE this idea for a quick and easy weeknight all-in-one meal! I love tacos any way, shape, or form, so I am into this idea! A baked potato fiesta sounds like a great time to me! What is funny about this is I was seriously just thinking the other day that I needed a loaded baked potato and THIS is exactly what I meant. Looks great lady! these look so delicious! I love the idea of using a baked potato in place of a taco shell. Looks delicious! I am always looking for new taco night ideas. I love stuffing potatoes with all the good stuff! 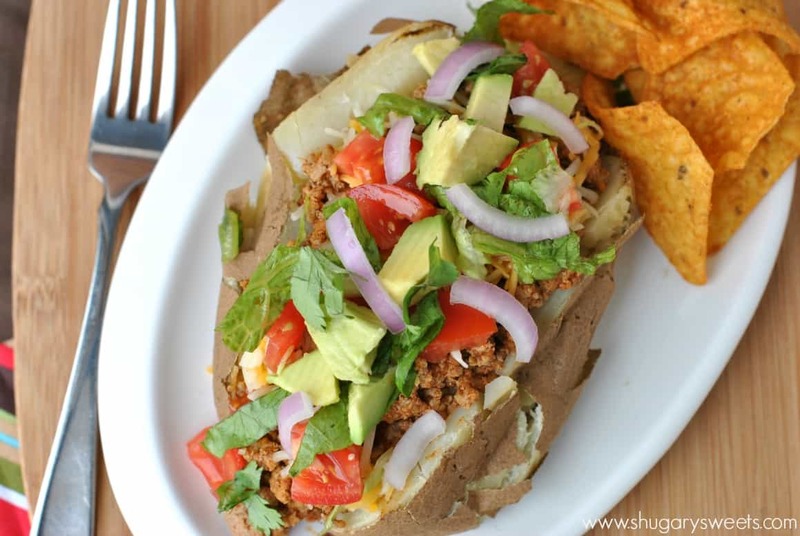 Potato boats with taco seasoned turkey meat sound absolutely delicious. Ultimate comfort food! Tacos + baked potato = one happy Jess. Aimee this looks like such an awesome way to have tacos for dinner! I always have extra potatoes lying around…who knew they were just waiting to be transformed into taco potato boats?! Taco in potato boats?! So creative and yum! Great idea; we love stuffed potatoes in the Winter time! Oh my these sound amazing! 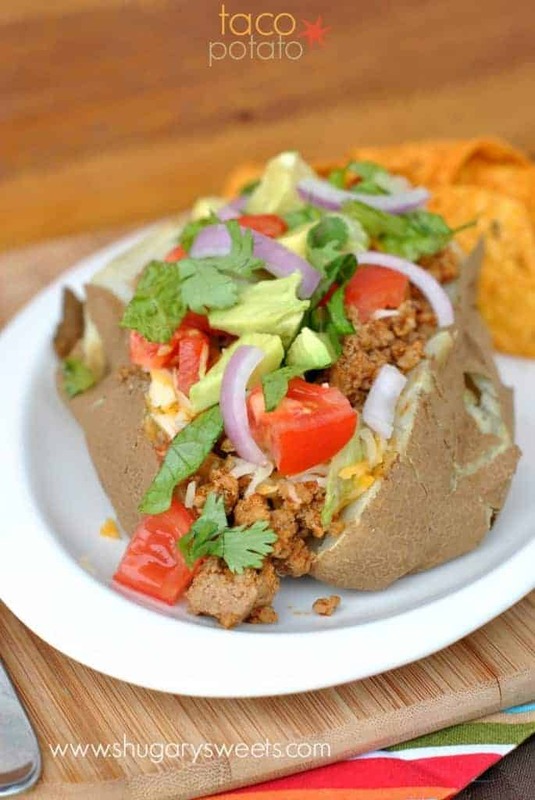 I love loaded baked potatoes but never thought of adding taco meat to the top. I’m sure the kids would love these – will be trying these out soon! That is such a great idea, Aimee! I know my husband and I would both love it! These look so good! I never would have thought of doing that! I can’t wait to try them! Can’t go wrong with a loaded potato! I have never seen a taco potato before, but this seems like the best idea ever! I’m definitely going to have to try this 🙂 Combining two of my loves…Mexican foods and potatoes. It actually fits in perfect with my Irish/Mexican family!